The socioeconomic background of Hispanic children is one important set of factors influencing their educational success and overall well-being. 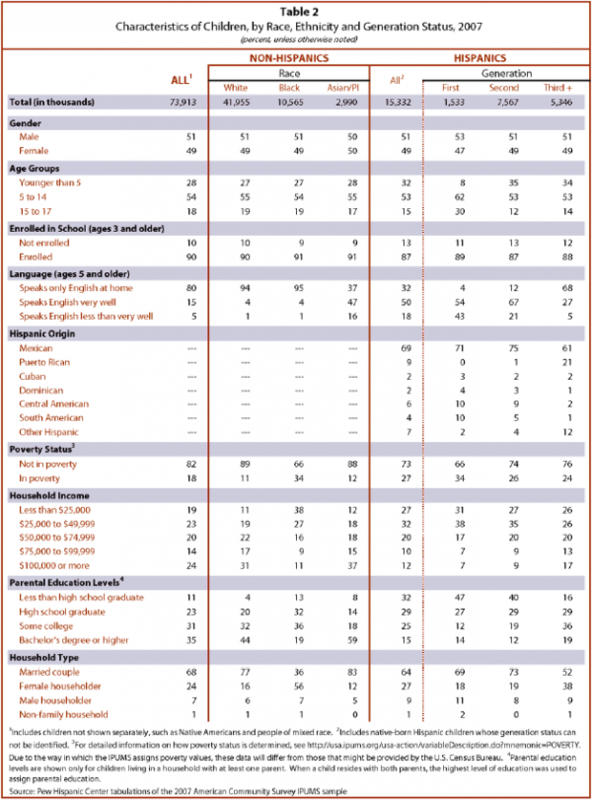 Table 2 presents a recent snapshot of the characteristics of Hispanic children by generation. The characteristics in the lower part of Table 2 refer to the nature of the child’s household, not the child per se. First- and second-generation children can reside in the same household (that is, they may be siblings), and so some degree of similarity can be expected in the nature of the household characteristics of first- and second-generation children. For several key characteristics, there are large differences among Hispanic children by their generational status. Foreign-born Hispanic children are twice as likely as their native-born counterparts to speak English less than “very well.” About one-fifth of Hispanic second-generation children speak English less than “very well.” U.S.-born Hispanic parents overwhelmingly use English at home and transmit English language skills to their children before the onset of kindergarten (Nord and Griffin, 1999). Accordingly, only 5% of Hispanic children in the third generation or higher speak English less than “very well.” English ability matters in part because it is highly related to educational test score performance (Nation’s Report Card, 2007) and high school completion (NCES, 2004). Hispanic children who are third generation or higher have much better educated parents than their first- and second-generation peers. Almost 85% of children in the third generation or higher have parents who completed high school, and 55% have parents who have completed at least some college education. Hispanic children of foreign-born parents tend to have much less educated parents. For example, only 60% of second-generation children have parents who have completed high school and only 31% of these children have parents who have completed at least some college. The household earnings and income levels of first- and second-generation Hispanic children are lower than those of children in the third generation or higher. About 30% of Hispanic children in the third generation or higher live in households whose incomes are at least $75,000. The comparable figure for first- and second-generation Hispanic children is just 16%. More than one-third of foreign-born Hispanic children live in poverty, versus about one-quarter of second-generation children and those in the third generation or higher. Although the basic socioeconomic factors suggest that Hispanic children in the third generation or higher may have a leg up on their peers, not all the advantages lie with the children of parents who were born and educated in the U.S. For example, Hispanic children in the third generation or higher are twice as likely as other Hispanic children to live in a female-headed household (Table 2). Single-mother families are more likely to live in poverty, and adolescents residing with both biological parents tend to display better educational outcomes and less risky behavior than do adolescents raised in other family arrangements (Ellwood and Jencks, 2002). One of the most extensive investigations of the well-being and outcomes of the children of immigrants found that “Along a number of important dimensions, children and adolescents in immigrant families appear to experience better health and adjustment than do children and youth in native-born families” (Hernandez, 1999). With the exception of obesity, second-generation Hispanic adolescents seem to have fewer physical health problems than their counterparts in the third generation or higher. In conclusion, many important aspects of the lives of Hispanic children vary by generational status. Projections suggest that the family context of Hispanic children is changing and that in future years a greater share will be born into families that have been in the United States for at least a generation and whose parents will have been born and educated in the U.S. This compositional change will likely affect the educational and social outcomes of Hispanic children—perhaps for the better, perhaps not.